Tahini is an excellent source of protein, calcium, copper, manganese, Vitamin E and the amino acid methionine. It is a source of the healthy fatty acids omega-3 and omega-6. The historian Herodotus writes about the cultivation of sesame 3,500 years ago in the region of the Tigris and Euphrates rivers. Tahini is mentioned as an ingredient of hummus kasa, a recipe transcribed in an anonymous 13th-century Arabic cookbook, Kitab Wasf al-Atima al-Mutada. Tahini is a staple of Middle Eastern cooking. It is also an ingredient in some Chinese, Korean, Japanese, and Indian dishes. In the United States, sesame tahini, along with other raw nut butters, was available by 1940 in health food stores. The largest sesame producer in 2010 was Burma (Myanmar), and the top three producers, Burma, India, and China, accounted for 50 percent of global production. East Wind Organic Tahini is a seed butter made from sesame seeds, which we usually get from Mexico or Nicaragua. Since it is naturally somewhat bitter, most people do not use it as a spread like other nut butters. It is used in many popular vegetarian and Middle Eastern recipes. Because the sesame seeds in East Wind Tahini are lightly roasted, our tahini is less bitter than some brands. The only ingredient is mechanically-hulled sesame seeds. No stabilizers, preservatives, artificial flavors, or colors. Tahini is super for dressings and glazes. And, where would hummus be without it? 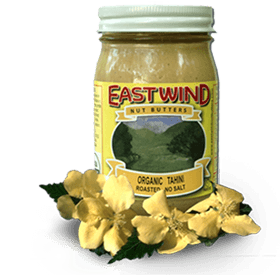 East Wind Tahini can be purchased in a 4-pack of 16-oz. glass jars, a case of 16-oz. glass jars, or in 15-lb. buckets.